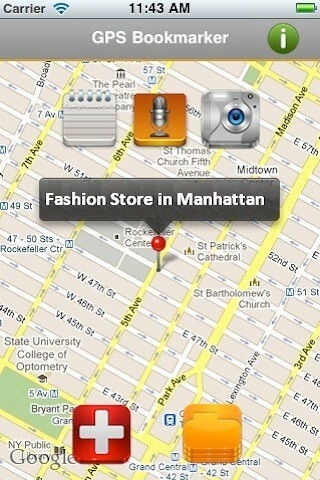 Putting aside for a moment the iPhone location tracking issue, what was the last time you used the iOS Maps app? Apple’s built-in software does turn-by-turn navigation and lets you enjoy detailed satellite imagery and street-level photography, but it otherwise leaves a lot to be desired in the features department. For example, it won’t let you attach detailed information about saved location, the stuff like images, notes or voice memos. GPS Bookmarker, a new mapping tool for iOS and Android devices, solves these shortcomings. The program lets you bookmark your current location and save it in a database on your phone. You can name the location and personalize it with custom categories, notes, pictures or voice memos so you can quickly pinpoint that fine restaurant or a bookstore later. It also does turn-by-turn directions. For example, if you’re buying a house you could use GPS Bookmarker to take a picture of your future home, record a voice memo with contact info and attach that to the location. Or, why not snap a picture of you car at the parking lot along with a memo of the spot number to easily find your vehicle later. I can also see you bookmarking your new girlfriend’s home location with a photo so you don’t embarrass yourself asking for directions each time you come by. GPS Bookmarker costs three bucks. A try-before-you-buy version is also in the works and should appear on the App Store within days.